"Return to me." Gifted to Kili by his mother, this labradorite stone bore 6 runes etched onto its polished surface. "Return to me" a constant reminder of a promise he made before their quest began. The Hobbit: The Desolation of Smaug Kili's Rune Stone is sculpted and created by the same artists and craftspeople who worked on the movie The Hobbit: The Desolation of Smaug! 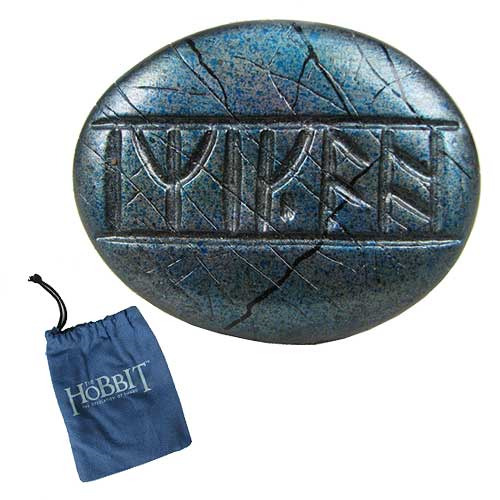 The Hobbit: The Desolation of Smaug Kili's Rune Stone is made from polystone and painted to create the appearance of labradorite. Measures about 2-inches wide x 1 1/2-inches tall.